Gongs Ahri spoke as she pet the white rabbit on her lap. The rabbit, who was currently sleeping with its belly exposed, was Maksu. Gongson Ahri rubbed Maksu’s cheeks, then discovered that there was a tiny leaf poking out of its belly and poked it. The leaf moved away from Gongson Ahri’s hand as if it was alive. When Gorgon Ahri made a surprised face, Maksu suddenly stood up from his spot. Maksu straightened his ears to listen for a bit, then sniffed the air a few times. After this, he leaned left and right a few times, turned around, and began to run. When Gongson Ahri followed Maksu, she realized they had arrived at the place where Cho Ryu Hyang was. The drill hall of the Sichuan Branch. Once she arrived there, Gongson Ahri paused for a bit. That was because that child was there. Maksu ran towards Cho Ryu Hyang while Gongson Ahri hesitated. Gongson Ahri turned the other way when she saw Cho Ryu Hyang. She didn’t know why, but she felt the need to look at Cho Ryu Hyang, but her feelings were conflicting. She felt good when their eyes met, but her chest hurt at the same time. Gongson Ahri’s face reddened once she thought that much. While that was going on, Maksu had already reached Cho Ryu Hyang. Gongson Ahri saw this but was unable to move. She wanted to talk to Cho Ryu Hyang by using Maksu as an excuse, but she couldn’t really do that nowadays. Cho Ryu Hyang had become noticeably colder to her. He just nodded when she said hello, and he always acted as if he was busy. That made Gongson Ahri feel sad. Gongson Ahri looked down at her clothes and sighed. She hadn’t thought much about her clothing because of Maksu. And there was one but person who was watching all this. It was Sunwu Cho Rin. There was Cho Ryu Hyang at the end of Gongson Ahri’s gaze. Just what did she like about that child? Sunwu Cho Rin looked at Gongson Ahri with a complicated face, then turned around. She needed to focus at her task in hand. 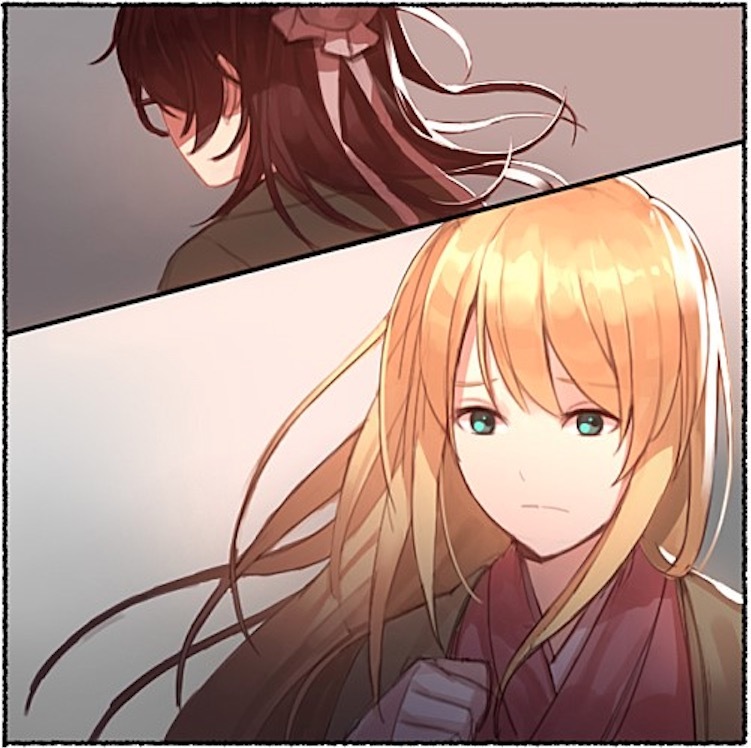 Sunwu Cho Rin tried her best to wait for the change that Cho Ryu Hyang had mentioned. Cho Ryu Hyang turned when he heard a voice next to him. He knew that Maksu had come here from the start. He just didn’t bother to talk to him. Maksu frowned and looked at the formation in front of Cho Ryu Hyang with strange eyes. Maksu asked Cho Ryu Hyang a question with a shocked voice, but the boy chose to ignore the rabbit. It would just be a waste of time to try and explain things now. Cho Ryu Hyang waved the rabbit away and focused on his formation once again. Maksu looked at this dumbly, then turned to the formation as well. But no matter how much he tried to look, he was unable to see anything. He decided to step in out of curiosity. When Maksu made a surprised face, Cho Ryu Hyang pulled the rabbit back with a frown. Cho Ryu Hyang paused when he heard this. He brought the rabbit to his eyes and spoke. Cho Ryu Hyang looked at Maksu with an annoyed face. A being that was not human. This rabbit really must have something special going for him. There was no way one could see dots inside the formation with normal eyes. Even Cho Ryu Hyang had to use his Godly Eyes to see in the formation. Maksu seemed to possess an ability to see things like this on instinct. Cho Ryu Hyang looked at Maksu with a curious gaze. Maksu began to twist and shake as if he was getting tired of being hung in midair by Cho Ryu Hyang. The boy put the rabbit down carefully. Maksu huffed and puffed angrily once he was put down. The rabbit spoke arrogantly out of anger. Looking at this, Cho Ryu Hyang smirked. When Cho Ryu Hyang said this and turned away, Maksu began to shout in outrage. But the boy just decided to ignore all this. The reason why he had turned away wasn’t because of Maksu, though. He had felt her standing far behind him. The moment he saw her, he turned away. He asked himself why he was like this, but he didn’t really have an answer to it. Everything he came up with seemed no more than a poor excuse. He felt annoyed when he thought that he was just being an idiot by himself. Gongson Ahri was acting normal to him, but he wasn’t. Cho Ryu Hyang cursed his own cowardliness and went back to work. He was afraid that his thoughts would begin turning into audible words otherwise. Gu Hui made an astounded face when he saw the ocean in front of him. The waves struck the coast and created white bubbles. At the same time, a salty smell struck Gu Hui’s nose. Gu Hui looked forward after speaking to his subordinates. Right now, he was extremely confused. From what he knew, there weren’t supposed to be formations that changed so drastically like this. This was why he did not know what he was to do as of yet. The only reason why he was able to pass the first change so easily was because there was a weak point in the formation. There was no weak point. Gu Hui slowly moved along the coastline and tried moving his toes in a certain way. After doing so, he frowned. Normally, a formation would reveal a part of its true form once a person used either the Mountain King Steps or the Heavenly Master Steps. These two steps were two of the many techniques to destroy a formation. Gu Hui tried using other techniques, but he didn’t get anything. The formation refused to react. Gu Hui looked forward at the sea with squinted eyes. This formation was indeed very powerful. But it didn’t even harm anyone. Gu Hui would be the one to benefit the more time was spent. Did he have a different plan? The experts of the Alliance were being slowly disintegrated by Cho Ryu Hyang’s trap. The woman who seemed to be a leader amongst a group of female experts spoke once a red light flashed ahead. With the command, the 20-30 experts in the group inserted the nets in their hands deep inside. They seemed to be trying to catch something in midair. A few people brightened once they seemed to have caught something. The experts quickly pulled up their nets. Something big seemed to come out with a little bit of resistance. This was something that even the commander was unsure of. What these experts were catching with their nets weren’t fish. The commanders quickly brought the shocked subordinates back to their senses. The subordinates seemed much more lively than before. This was because they now understood what the heir’s commands meant. This was what the heir called this tactic. Because of the strange name, Sunwu Cho Rin smiled. She hadn’t realized what the heir was talking about back then. No, the tactic was so obvious that she didn’t know what it was. Sunwu Cho Rin could only be astounded when she saw enemies being dragged out and being suppressed immediately. Just how would a formation have to work in order to make something so strange like this happen? Not even she had expected to be able to take down experts as easily as this. But as time passed, problems began to arise. Sunwu Cho Rin clicked her tongue at the experts that began to resist. The heir most definitely expected this as well. It was Qing Song Ja. Even when exhausted, he was able to fight like a peak expert. And because of that, several experts were able to come under his wings to fight. Indeed, the heir was smart. Sunwu Cho Rin had to admit that. Her job was to take care of experts like those. But as she ran towards Qing Song Ja, she paused for a second. Wouldn’t it be easier to kill everyone using the formation, not them? Wouldn’t that cost less people and be easier as well? Did the heir just not think that far? Sunwu Cho Rin quickly shook her head when suspicion rose up in her head. For now, getting rid of the old expert was the most important. She shouldn’t get the order mixed up. After taking a deep breath, Sunwu Cho Rin tightened the grip on her whip and narrowed her eyes. Then she carefully looked at Qing Song Ja, who was spraying sword qi everywhere. In a few moments, Sunwu Cho Rin’s eyes widened. At the same time, a mad smile appeared on her face. Sunwu Cho Rin moved like lightning. She needed to beat him as fast as possible. After all, the other side was as strong as her. Sunwu Cho Rin’s smile deepened as she neared the old expert. Her murderous aura got stronger as well. Qing Song Ja began to shoot out sword qi at her as he began to feel danger. The whip in Sunwu Cho Rin’s hands dodged the sword qi and penetrated towards Qing Song Ja. It was a perfect attack executed at the perfect time. The tip penetrated itself deeply inside Qing Song Ja. Qing Song Ja looked at the whip incredulously. And as he tried to grab onto the whip. Sunwu Cho Rin took it out with a grin. There was some blood, but she didn’t care.